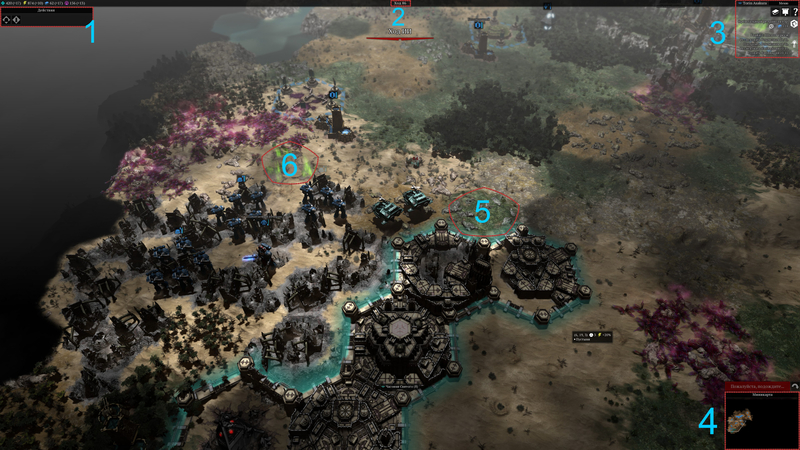 Being ardent fan of warhammer universe I could never miss the new game – Warhammer 40.000: Gladius – Relics of war. To be honest, it reminds me of another another game – Pandora:First Contact. Well, I guess it`s not surprising since both games were created by the Proxy Studios. There is not much to see in their 4X portfolio, but it`s obvious that design not their strongest area. Game mechanics, on the other hand, are much better despite fruitless efforts to create in-game balance to supplement said mechanics. 5. The secondary screens, like “About developers” -1/10 . No adaptivity, just eternal scroll and apathy. Did I mention that design is not the strongest area of this guys? If not, seeing Gladius will prove previous statement true. Action block is useless. No, really they could have put it under moves counter(2) in the central area and put quest or research block(3) on it`s place. Moves counter(2) is almost invisible. At least for a 4k resolution. Seriously, for first couple of games i`d simply forgot about it. Only when I d decided to see how much moves I did during the game I realized that moves counter must be there. It took some time to find it. The first things you see when you have started the game are…things you actually don`t see. Sorry for Klichko-style speech. But seriously – script is almost unreadable in most cases. Also, why do we need knowledge count for technologies? I would have liked to see flank attack indicators in this game . Same goes for a long-range artillery. Did we already discuss cells info? Such information would be invaluable for breaking through defensible positions, such as enemy fortresses. Strategic points mast have clear graphical indications. M-U-S-T. It`s a strategy after all. In our case, we are giving commands to our units. Anyway, to reach maximal efficiency the relevant information in user`s interface panel should be located in one visual range. Otherwise a player loses focus. Obviously, in our case, developers didn`t know about this or just forgotten. So we are forced to lead cursor from central vertical to the furthest edge of the screen. It`s just awful. Now, lets discuss balance. It will be rather simple, because there is nothing to discuss. Balance is totally absent. Do you remember old good Civilization? Yes, the game sufficiently advanced caveman with landscape bonuses can destroy a tank or two. Balance in Gladius is pretty much the same. For example for three hours I lead a bitter war to exhaustion in ruins around the fortress. Three squads of space infantry with captain against level 1 to 4 predators. Damage was minimal. In the end, the side that gets best defensive/landscape bonuses wins. It makes fighting against Necrons almost useless. The same goes for the games with difficulty level set above average: sometimes it seems that Gladius AI was getting war art lessons from an old spam-bot. It`s just keeps sending troops against you. With disbalance we have already described it turns the game into war to exhaustion. Your own exhaustion will turn into boredom pretty soon. If in fact it is Gladius First Public Beta – forget everything you read here. If not – Houston, we have a problem! The sitution with design/ui/ux is quite deplorable, Gladius simply can not be on the same shelf with other products of the Warhammer universe, no, whether it’s 40k or classic. A game of the same scale as Gladius should have had no right to keep in the arsenal of only 2-3 types of animation when receiving damage from the unit (sparks and indistinct blood sprays without the right to random access). If you read the comments to the patches – the management of the company is disgusting. It creates the feeling that they do not have a plan, do not know where to move and what the final consumer of their so-called product needs.